The Foundation | I’ve raved about Estee Lauder Double Wear Foundation in so many blog posts already, but it really is one of my all time favourites. I believe the one above is my third bottle and it’s almost empty, so I’ll be buying a new one asap. If you like full coverage, flaw perfecting, spot hiding, even looking foundations – then this is the one for you! It does feel a little heavy after around 8-10 hours, but what do you expect from a foundation with such high coverage. It’s the only one I have that stays in place all day no matter what I’m doing! The Corrector | To me, the amazing Bobbi Brown Corrector is the difference between faking having a good 8hrs sleep and looking like I haven’t slept in a week if I haven’t used. As someone who is utterly cursed by genetic dark circles, this creamy yet blendable product works wonders to lighten and brighten my under eye area, with the help of that ultra correcting peachy tone. I wouldn’t be without it! 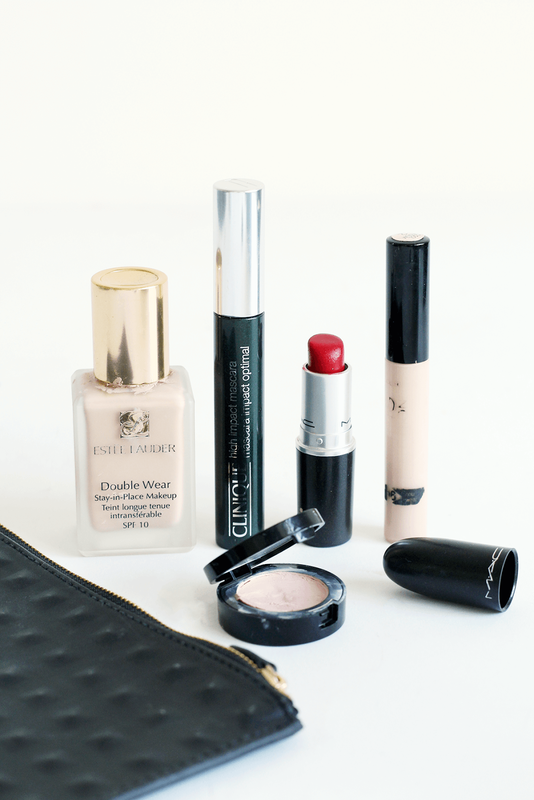 The Concealer | While I’ve tried my fair share of high end concealers, one I always come back to is the Collection Lasting Perfection Concealer. For around £5, this little tube of greatness covers blemished and under eye circles perfectly without looking cakey or dry. I switch between shade 1 and 2 depending on the time of year and I honestly can’t fault it! The Lipstick | As you may be aware, red lipstick is sort of my thing. I must own more reds than any other colour in my collection, so it’s no surprise that MAC Lipstick in RED had to be in my top picks. I really love this shade, as it’s not too blue and not too pink, so flatters my complexion perfectly plus the pigmented formula means it lasts ages too! The Mascara | I mentioned this in a recent post, but the Clinique High Impact Mascara really is one of the best I’ve ever used. It’s lengthening, makes my lashes look thicker and is seriously black which is perfect as I love having really dark lashes! Think I’m onto my third or fourth tube now and I rarely reach for anything else unless I’m testing something for the blog! What’s on your forever repurchased list?